Previously unseen images of Roger Bannister breaking the four-minute mile have been uncovered in a chance discovery during a newspaper office clear-out. 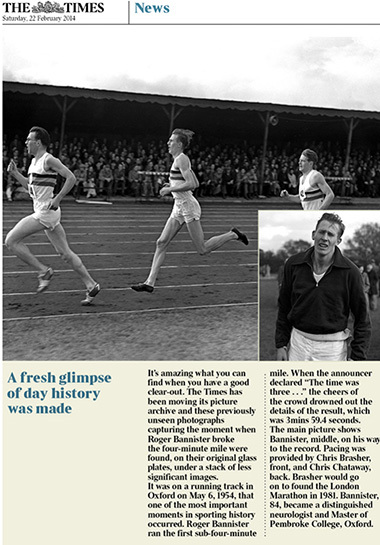 ‘The Times has been moving its picture archive and these previously unseen photographs capturing the moment when Roger Bannister broke the four-minute mile were found, on their original glass plates, under a stack of less significant images,’ stated The Times on Saturday. Bannister broke the record on an Oxford running track on 6 May 1954, in 3min 59.4 seconds.